This past Tuesday evening, May 7, the “Mighty Elements” arrived in Lancaster County. I’m talking about the mighty elements of Earth, Wind & Fire, one of the most musically accomplished, critically acclaimed, and commercially popular funk bands of the 1970s. I can remember listening to them back in my high school and college days. It was cool to see three of the original band members still rockin’ it out – lead singer Philip Bailey, bassist Verdine White, and percussionist Ralph Johnson. 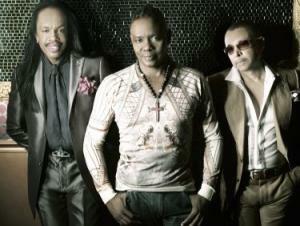 Earth, Wind & Fire is a sophisticated, well-oiled machine that is very much in tune with what they do best, and what their audience wants to hear. They started the show with the 1979 R&B hit “Boogie Wonderland,” and one after another, the hits just kept coming – “Got to Get You Into My Life,” “After the Love Has Gone,” “Sing a Song,” “That’s the Way of the World,” “Shining Star” and more. They played a few songs I wasn’t as familiar with, but enjoyed just as much. The band incorporated jazz, soul, gospel, pop, rock, blues, folk, African music, and disco into their musical mix. They also filled the stage with great visuals – an amazing light and video show that created a super effect which drew the audience in even more. Throughout the evening, each band member had their opportunity to shine. Whether it was the vocalists, the percussionists, the horn section, or the keyboards, every member played their part, and played it well. I especially loved when the sax and trumpet players would come front and center and wail some blues or soul on their horns. Another highlight was when Philip Bailey played the kalimba, an African thumb piano. At some point during the show, I realized that from the first notes, I had been constantly moving. I was either tapping my feet, bobbing my head, clapping my hands, or swaying back and forth (or a combination of several!) For the last three or four songs, I was on my feet dancing like no one was watching, along with every other person in the balcony who was doing the same thing! From the moment I heard that Earth, Wind & Fire was coming to AMT, I felt that the show would be good, but the “Mighty Elements” proved me wrong … they weren’t just good, they were terrific! !